Molecular Beam Epitaxy (MBE) is a key technology due to the unique structures and exact dimensional control that can be achieved. The SVT Associates, Inc. MBE System is a high performance tool which can be configured for a wide range of material applications. 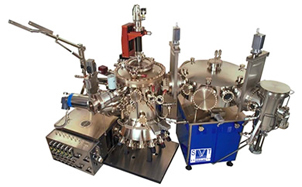 SVTA manufactures the MBE systems, deposition sources, and the essential process monitors. SVTA has full growth process knowledge from our experience in our own laboratory and the previous experience of our staff. This integration results in excellent control over quality and cost, to offer the most cost effective tool available for MBE. 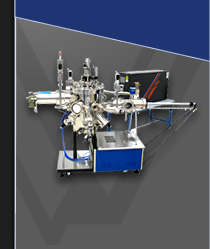 SVTA MBE systems offer an ultra-pure environment for precision fabrication of thin film structures for semiconductor, opto-electronic, photovoltaic, and magnetic applications. SVTA MBE Equipment is specially designed for the materials they produce. The MBE Systems are equipped with hardware and software capabilities to monitor, display, and control critical growth parameters. SVTA Systems are designed around a modular configuration consisting of several functional units. The modular system concept is a flexible and reliable way of adapting to different customer needs. Typically, there are at least two separate modules, one for the deposition process and one for wafer loading/sample preparation. There are other processing modules, such as cluster tool or material analysis modules that may be added depending on the customer needs. Systems with multiple growth modules for “incompatible” materials are available. Each module has its own independent UHV pumping system and can be isolated from other modules by gate valves. 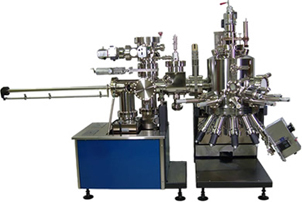 This arrangement makes it possible to perform various system functions independently and concurrently: substrate loading, sample treatment, film growth, and sample analysis.